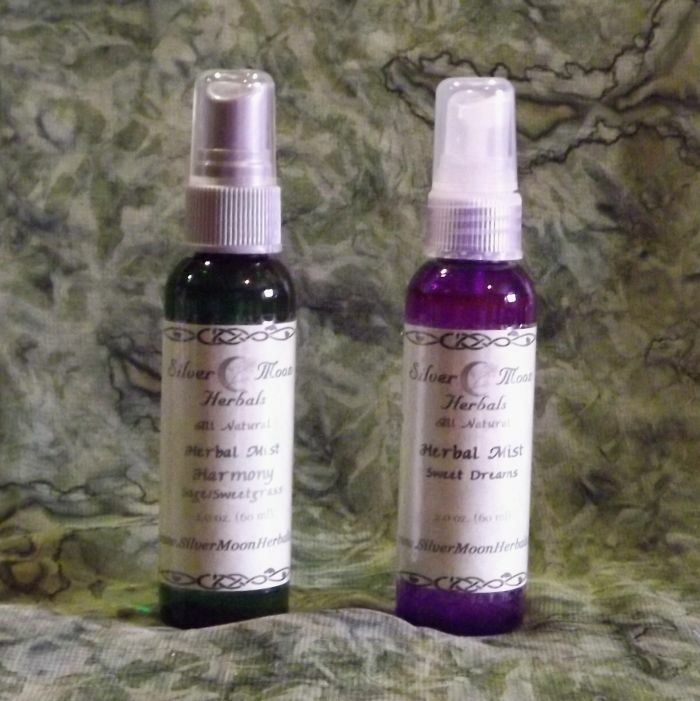 Our all natural herbal fragrance mists are made with 100% pure essential oils and hydrosols. Blended in a base that makes it a fine mist that can be used as a pillow spray, room spray or an air freshener. Sweet Dreams - This Lavender blend, is great to spritz on your pillow before bed. Witchy - fun, exotic, sweet, spicy, sensual. Bring out your inner Witch! Harmony - for smudging when you do not want smoke. It is used to banish negative energy, heal, bless, and cleanse a house, person or object, to establish positive energy, clear thinking, harmony of thought and healing. Harvest Moon - aka our Pumpkin Spice scent. Down to Earthh - Earthy - grounding, balancing. Hippy Chick - Sweet/Earthy - fun, sensual, mood lifting, balancing. See the Learning center for ingredients and properties.